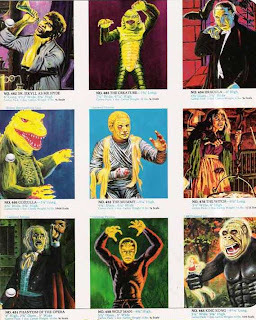 When I was a kid I loved monsters. Okay, not much has changed. I still love monsters but as a kid I was nuts about them. I can't recall a certain event that triggered it...I just became obsessed with monsters. I'll share more about that later. Today I want to talk about the Aurora monster models. I loved these. I can't remember which ones I had but I know I had 2 or 3 of them. Unfortunately I never got around to painting them. They just stayed their weird glow-in-the-dark greenish white. I do remember that I had the Creature from the Black Lagoon. To this day I think his model is one of the more interesting ones because of the texture of the skin and the iguana sitting on the rock. I wish I still had those models. I have no idea what happened to them. They probably got broken and lost pieces to the point where they had to be throw away. In a way, I wish I was more sentimental about stuff but if I was I'd have a house full of crap. At least I have my memories.